Concrete information founded in years of experience and culmination of exhaustive research talking to hundreds of top shooters. In any sport there always people who love to give instruction, it makes them FEEL like they are an authority on the subject. The problem is, 99% of them have had no professional education background, and have no idea of HOW to teach or impart information so that it is understood, accepted, and retained. These CDs were created by Roger W. Breternitz CCHT Certified Clinical Hypnotherapist, professional with 2 degrees in education, 30 years shooting experience, and a "Neuro Linguistic Programming" background. This is the actual WAY you perceive, and receive information, the bottom line being...IT GETS RESULTS! It is my personal guarantee that after listening to CD #1 and applying the concepts therein, and listening to CD #2 at least once a day for not less than 15 days in succession, if you are not shooting better scores at any distance on a standard trap range your money will be fully refunded, minus shipping & handling. Ivan Muntz-Brown - Los Angeles Ca.-I think your trap shooting cd's are beyond awesome. The reprogramming cd's work almost like magic. It's really helping me big time in terms of improved concentration and relaxation under pressure plus a much stronger and bigger self-image which means more self-confidence and trust. Ted Malick - Santa Monica Ca. - I would have never believed that my mind could be reprogrammed to make me relax under the pressure of breaking all 25. I had my first 25 straight last week and all because I could relax and just shoot without thinking. This stuff is awesome, I'm telling eveyone I know about you. This is a dual CD system with two (2) separate CDs, employing the idea that first there are tips and "Tricks" about this particular sport that if employed, will gain you an edge over someone who does not employ these techniques. These are called the plain mechanics of the sport that will make you instantly better when you employ these techniques, which to most people have not already been apparent. Even experienced shooters say there are things on this CD that they were remotely aware of, but not doing, or at least not doing correctly. When most people take up a new sport they watch others who are considered good at that sport and try to mimic them and their behavior. This works up to a point, but there are many aspects of the "Model's" behavior that one does not see or perceive, and these are the "Secrets" as we will call them here. Even though you may be lucky enough to gain some pointers from experienced shooters it is very difficult to find someone who has the special gift of teaching with the professional degree of expertise in the art of instruction. Many are great at this sport, but like in most sports it's more difficult to TEACH successfully than it is to do it. That's why many people are great "Players", but few are great "Teachers". These CDs were created from a professional educator's viewpoint using the most up to date instructional methods to bring about the most permanent retention, and application, of information learned. CD #1 in the Dual CD System we call the "Mechanical" instruction CD, the actual physical behavior that will instantly give you an edge, and improve your scores when these techniques are employed. These are things that you may have already wondered about or questions you have asked yourself, and don't yet have the answers. When you seek help from people they will ALWAYS give you advice, and people LOVE to give advice, even if they don't always know what they're talking about. Well intending, self-appointed "Experts" have done more harm to a newcomer's learning curve that just about anything else. This CD gives you all the do's and don'ts of buying the right gun, gun fitting, and set up, equipment selection such as shooting glasses, the right type of ammunition for the specific situation, tricks on concentration, breathing, eye focus tips, how to stand for each station, concepts that give you an actual edge the moment you employ them. This CD by itself is well worth the price of BOTH CDs! CD #2 in the Dual CD System is the relaxation / reprogramming CD in the dual CD system. This has a gentle relaxation script that takes you to a new and deeper state of relaxation deeper than you've ever known, while implanting positive affirmations in your subconscious that will be relayed to your conscious mind later bringing about a powerful, noticeable change in your outward physical behavior. The end result is...you HIT MORE TARGETS with less effort and develop greater self-confidence which makes you even better! After you know WHAT to do then actually doing it is another story as we all know.This CD implants the knowledge you have heard on number one CD, into your deeper warehouse of information that holds everything you have ever seen, read, heard, or perceived, and later you can recall it accurately to bring about the desired results. End result...you break more targets with less effort and WIN, WIN, WIN! Which by the way gives you new incentive to work harder when you have this kind of success! These two CDs together have got to be the most comprehensive, results orientated instructional system on the market today for the sport of trap shooting. No other company is offering this type of real world instructional system on trap shooting that will get these results (or your money back). When you spend thousands of dollars on one or more guns, constant expense on ammunition, more on glasses, clothing etc. doesn't it make sense to spend a fraction of that on what actually makes is all work, and what makes you a winner...or a loser? YOUR MIND! The benefits we guarantee will go far beyond trap shooting. Start WINNING, because WINNING is a lot more fun! 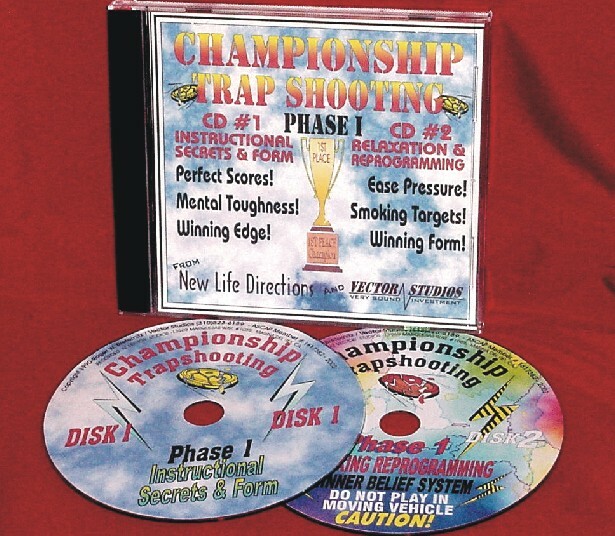 This is once again a a dual CDs system with two (2) separate CDs, (pictured above) employing the idea that first there are tips and new realizations about trapshooting that when employed, will gain you an edge over someone who does not employ these techniques. Phase II is related to Phase I like this. When you learned to ride a bike you most likely started off with a smaller frame, smaller wheels and probably had training wheels to help you. Then as you learned you raised the training wheels off the ground until you finally didn't need them. LEARNING to relax the mind is like learning to ride a bike, it takes a while and some practice. However; once you do learn you don't want to stay on a child's trainer...you want a bigger faster bike. Phase II is the "10 Speed Racer" of mental reprogramming systems for trapshooting! It is the "High gear" for your shooting proficiency, and is guaranteed to push you into a new higher level of shooting you never actually thought possible.The human mind is the most powerful force on Earth when directed properly and focused on a single goal. Phase II directs and focuses you to the goal of winning easier that you thought possible, because it uses your own experience to build on. Phase II takes you to another higher level of proficiency by using the knowledge and skill you ALREADY have from your years of experience of shooting. If you have ever been in the "Zone" as they say, then Phase II will show you how to return to that place of perfection anytime you want, shoot the way you did when every thing you pointed your gun at turned to a smoke ball. That was because you were in a level of mental acuity called "STATE". Everyone has had a time when everything they touched turn to gold, wouldn't it be great if we could enter that state of mind each time we walk out on the trap field, and bring with us that same level of proficiency? THAT'S what Phase II is all about, but...you must first learn how to "Condition" yourself to relax and freely accept the belief changing reprogramming that the "Relaxation Reprogramming" CD administers. This is why you need Phase I first, to teach you how to relax, how to employ the belief changing techniques, and experience the initial success of these techniques. Then Phase II puts you into the high gear of shooting proficiency and no one can catch you! Phase I & Phase II are by far the most comprehensive, results orientated, instructional system on the market today for the sport of trap shooting. No other company is offering this type of real world instructional system on trap shooting that will get these results (or your money back). When you spend thousands of dollars on one or more guns, constant expense on ammunition, more on glasses, clothing etc. doesn't it make sense to spend a fraction of that on what actually makes is all work, and what makes you a winner...or a loser? YOUR MIND! The benefits we guarantee will go far beyond trap shooting. START WINNING, because winning is a lot more fun! For the past 3 years Roger has been writing powerful articles for the INTERNATIONAL ARCHER MAGAZINE on the subject of mental toughness, concentration, relaxing under pressure, and how to use the power of your mind to HELP you win when the pressure is on. He has adapted these 20 separate articles to the intense sport of Trapshooting. Now you can get all of these three years of articles on THREE CDs for the one low price of $59.95 (includes shipping & handling). Now instead of wasting time stuck in traffic, or when you have some slack time, you can be listening to new ways to develop your most powerful asset, your inner mind, which is what really gets you to the top, once you know how to shoot! It also has the same $ back guarantee. Titles include, Winning Concentration, Distractions, Handling Pressure, The Fear of Winning, Learning to Relax, Your Power Switch, Power Visualization and many more. So next time you're stuck in traffic, on a boring plane, or just got a few spare minutes, you could be learning how to restructure your attitude, and develop rock hard concentration to come out a winner each time you walk out on the field. No matter what the conditions, who you're shooting with or how you equipment performs, there's only one thing that makes you a winner, YOUR MIND. Start expanding it with "The Mental Side of Winning" and start coming out on top more and more. These CDs also come with all articles on MicroSoft Word doc file on a forth CD so you can print them out if desired. Don't wait ORGER NOW!